May the presence of God’s Son, whose coming we await, give us—the HALO family, including you, our readers and supporters—joy in our blessings and consolation in our trials. We, members of the HALO Board of Directors and the Board of Advisors, wish you all a blessed and happy Christmas and New Year. It is with delight that I greet you this Christmas season and welcome you to the HALO family. As we celebrate the birth of our Savior and remember the love, trials and sacrifices of the Holy Family, I give thanks for all you do to defend and befriend the most vulnerable among us. May God bless you and your families and grant you His peace. I want to say, “Wow! Thanks be to God! And Merry, Merry Christmas!” The reason for my exuberance is that I have been around a long time and I am not easily impressed, nor am I the first to jump onto a moving bandwagon, but the HALO bandwagon is on the fast track and the right track. I was motivated to “climb on Board” when I was informed the organization could use a senior citizen (close to the end-of-life) as an advisor. I am truly impressed! I’ve observed a lot of new charitable organizations, with enthusiastic founder volunteers, starting up to take on the Goliaths of the secular world, only to suffer early setbacks due to almost insurmountable obstacles. The progress was slow and painstaking, often due to the volunteers’ own inexperience, and sometimes because of the lack of a clear-cut MISSION. Witnessing the expertise and dedication of those who have joined forces to get HALO off the ground, make it operational, and propel it into a life-saving organization so quickly and comprehensively, has been truly remarkable! The HALO volunteers are filling a void and giving the world a much-in-demand Christmas present! Again, Merry. Merry Christmas! May God bless you abundantly in this upcoming year! God became a helpless human infant who was totally dependent on two people who did not understand Him. May we love and cherish others who are dependent or difficult to understand to the very end. May no one's death be hastened today, tomorrow or ever. In this beautiful season for celebrating the birth of a very special Child, may we all reflect on the tremendous gift of our own life and that of our elderly, disabled, and chronically ill loved ones, and most of all, on what the Christ Child was born to give us: eternal life with God. I wish each of our readers and supporters a most blessed Christmas and New Year! The birth of Jesus offers a strong message about the value of all human life from conception to natural death. HALO offers help to protect each person until natural death. We wish you a most blessed Christmas, hoping that the Christ Child brings you His peace and that the Holy Family continues to inspire you to defend the innocent and the vulnerable. God bless you all. In this season of Advent, we remember not only the dignity of the most vulnerable, as Christ was at his birth, but also the fact that we must be ready for when Christ comes again. Let us never forget to receive everyone in our midst with mercy, so we may be received likewise into God's embrace when we meet him at the completion of time. At the Euthanasia Prevention Coalition, I am looking forward to a short family and spiritual break around the celebration of the birth of Christ. I anticipate an incredibly difficult new year as the assisted suicide lobby in the US will be introducing bills in at least 20 states. The assisted suicide lobby will also continue working to change the position of the American Medical Association to that of neutrality concerning assisted suicide. In the New Year the Canadian government will begin to debate the extension of euthanasia to children, to people with psychiatric conditions alone, and to people who previously requested to be killed by lethal injection in their advance directive. As crazy as the culture of death has become, I am a person of hope. My hope does not derive from human ideology or individual circumstances, but rather in the fact that there is life and hope beyond my mortal existence. We both believe that the communications this organization offers are sometimes the resource needed to change hearts and the direction in which end-of-life situations can lead us. May God bless us and give us all the words to help those who need help. The palliative care concept—relieving pain and other bothersome symptoms of disease—is a good thing. Also, when palliative care is provided by healthcare professionals who truly respect life, it is a blessing. However, palliative care medicine in practice often is not as advertised. Profound respect for the sanctity of life has always been the core ethical principle of medicine, but that is changing. Today, sadly, the truth that every human life has equal moral worth is rejected by utilitarian-minded bioethicists. The new bioethics divides human beings into two categories: those who are “wanted” and those who are “unwanted.” Like their brothers and sisters who are aborted at the beginning of their lives, the chronically or terminally ill, disabled, and elderly are in danger of being killed simply because it is inconvenient and/or costly to care for them. Palliative care is being used as a tool in this new bioethics to eliminate “unwanted” people. “Stealth euthanasia” means the intentional hastening of a patient’s death while pretending to provide appropriate treatment. A typical report that we receive from grieving family members is that their loved one, who had been alert and was not complaining of pain, was administered increasingly frequent and larger doses of pain medications and sedatives to the point where they were sleeping all the time and could not eat or drink. Some reported that patients were also denied their usual medications to control blood pressure, diabetes, etc. We wish to draw public attention to the practice of “terminal sedation” or “slow euthanasia” which is performed extensively today…A physician may lawfully administer increasing dosages of regular analgesic and sedating drugs that can hasten someone’s death as long as the declared intention is to ease pain and suffering…Compassionate physicians, without publicly declaring the true intention of their actions, often speed up the dying process in this way. Doctors (and nurses) who intentionally kill selected patients represent an earth-shattering shift in medical ethics. Thankfully, there are still some members of the medical profession who embrace the sanctity of life ethic. The difficulty lies in discerning who can be trusted never to kill. When a loved one is referred to palliative care, be wary and stay alert! Another big thing is euthanasia or mercy killing—killing someone if he is dying. To me it is not that bad if someone is old and suffering and he wants to die and you take him off life support. I don’t see that as bad. What is bad is when he doesn’t want to die and you do it anyway. The sad thing is, this student isn’t alone. Many young people today, even those who have grown up in good Christian homes, believe the lies that our twisted culture spouts at them. There is a dire need to educate students on the dignity of persons at the end of life; to teach them the truth about the value of all human beings, the sacredness of the sacrament of marriage, and the necessity of the family as the building block of society. The good news is that such a program exists. The Culture of Life Studies Program does all of that and more! The CLSP is a K-12 program that provides teachers and parents with the tools they need to help their students become evangelists of the culture of life—a culture that respects the dignity of every human being from creation to death regardless of age, appearance, or ability. The program has been endorsed by Cardinal Raymond Burke and Fr. Frank Pavone (founder and president of Priests for Life). Every CLSP lesson is created with the help of pro-life leaders and subject-matter experts such as Dr. Dianne Irving, Bobby Schindler, the members of the Healthcare Advocacy and Leadership Organization, Philip Lawler, attorneys from the Thomas More Law Center, Coleen Kelly Mast, and a host of other priests, doctors, lawyers, and educators. CLSP materials are positive, engaging, and flexible. Unit studies can be easily integrated into an existing curriculum, and the materials are appropriate for even the youngest students. Since 2015, the CLSP has released a full line of pro-life educational materials for students in preschool through 12th grade. Over 175 schools across the US and Canada teach CLSP lessons, including the entire Diocese of Wilmington, Delaware, where the program received its first diocesan-wide endorsement. CLSP materials were granted an imprimatur and nihil obstat by the Most Reverend Michael F. Burbidge, bishop of the Diocese of Arlington. In 2017, the Culture of Life Studies Program shared its Who Was the Real Margaret Sanger? video and discussion guide with 14,000 pilgrims (mostly young people) travelling to the March for Life. Who Was the Real Margaret Sanger? has also aired repeatedly on EWTN, sharing the truth about Planned Parenthood with an even wider audience. Given the success the Culture of Life Studies Program has enjoyed and the team’s reliance on God, the program recently took a huge leap of faith. We have now officially separated from American Life League to form a new organization—Light and Shield Ministries! Under this new ministry, the Culture of Life Studies Program will continue its important work of serving parents and teachers. Light and Shield Ministries will include more much-needed programs, like Life Defenders (a youth outreach program) and other life-affirming initiatives. Leaving American Life League presents us with both opportunities and, obviously, challenges. This next year we are poised to triple the number of schools teaching CLSP materials, we’re working with several dioceses to secure diocesan-wide endorsements, we have multiple lessons in the pipeline (including a revision of our euthanasia lesson for high school students! ), and we have plans to attend several pro-life and educator conferences, which will provide an essential opportunity to spread the word about our program. But to continue our important work, we need your help! I hope you will take the time to learn about this important life-affirming program. Truly our future depends upon it! Visit the CLSP website atcultureoflifestudies.com, click on the yellow “store” button in the upper right-hand corner to be directed to the CLSP store, and peruse the incredible life-affirming, educational materials we have created for students of all ages. Would you like to ensure that the next generation is equipped to take up the fight to defend preborn children, respect all human beings from creation until death, and speak the truth with confidence in defense of the innocent? I invite you to join our team of ambassadors for life by committing to pray for our efforts, offer your financial support, or by working with me to introduce your local schools to the CLSP. Please e-mail me at MFlores@CultureOfLifeStudies.com or call my direct line at 540-907-9648 to learn how you can support this crucial life-affirming educational program. And watch the next HALO newsletter for an article on our newly revised edition of Euthanasia: An Introduction! We have expanded this lesson to include three classes, which examine the complex topic of euthanasia by peeling back the layers of rhetoric to show students what is really at the heart of end-of-life issues. Using Church documents, this supplement provides students with a basic understanding of the Catholic Church’s teachings on euthanasia and gives students the tools they need for defending those teachings against cultural attitudes and pro-euthanasia arguments. PATIENT ADVOCACY VIDEO NOW AVAILABLE! What is the most important skill needed for patient advocacy? How can I be of assistance to a patient and/or family? How can I help the patient and/or family understand the treatment options open to the patient? Who can I call on for help if it’s needed? These are some of the useful topics covered in HALO'S YouTube presentation on Patient Advocacy. Please take time to view this valuable resource and keep it handy as an essential tool. If you have any questions about patient advocacy after watching this video, please send them to feedback@HALOrganization.com. When a loved one is seriously ill, having accurate information at your fingertips will enable you to advocate for them, to ensure that they receive appropriate treatment for pain and other unpleasant symptoms. Your knowledge and vigilance may even save a life! HALO’s new fact sheet is a guide to help patients and families discuss with their physicians and caregivers the drugs used to treat pain and other symptoms. It lists many of the drugs most commonly used in hospice and palliative care and their side effects. The dangers of certain combinations of drugs and the ways in which these powerful drugs may be inappropriately used are also explained. Additionally, this fact sheet provides essential information about pain control in general. 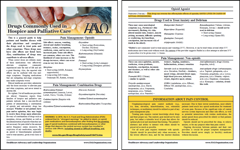 CLICK TO DOWNLOAD to The DRUGS COMMONLY USED IN HOSPICE AND PALLIATIVE CARE Fact Sheet. To order multiple copies, contact HALO at feedback@HALOrganization.com or mail your request to HALO, PO Box 324, Chisago City, MN 55013. Donations to cover the cost of printing and postage will be gratefully accepted. "I think this fact sheet will be a tremendously helpful resource for the patients and families we serve. We extol human dignity and exhort people to protect and defend life at all stages. However, there is a scarcity of practical, detailed advice for patients and families struggling to do just that when a loved one is seriously ill or at the end stage of life. This is why HALO's mission is so incredibly necessary." With this edition of the HALO Monthly, we are launching a new feature highlighting some things that have been done to brighten the lives of people who reside in nursing homes, are shut-ins and/or are receiving hospice care. We invite YOU to contribute your stories and ideas for publication in order to inspire the rest of us. Here is an example. While visiting a friend who is mostly confined to bed in an assisted living facility, I perused her surroundings. Mary has two rooms – a small, narrow bedroom with one window and a much larger kitchenette/living room with two windows. I moved Mary’s bed into the living room, which previously had gone unused, giving her significantly more space for herself and for visitors who no longer must sit in the cramped bedroom in order to visit with her. Another advantage is that Mary can now reach her phone jack/charger and doesn’t have to depend on staff to charge her phone and then bring it to her. Also, with double the windows, she can enjoy more natural light. By moving Mary's bed, there was a great improvement in her living conditions and she has less dependence on others. A simple, but highly effective change!